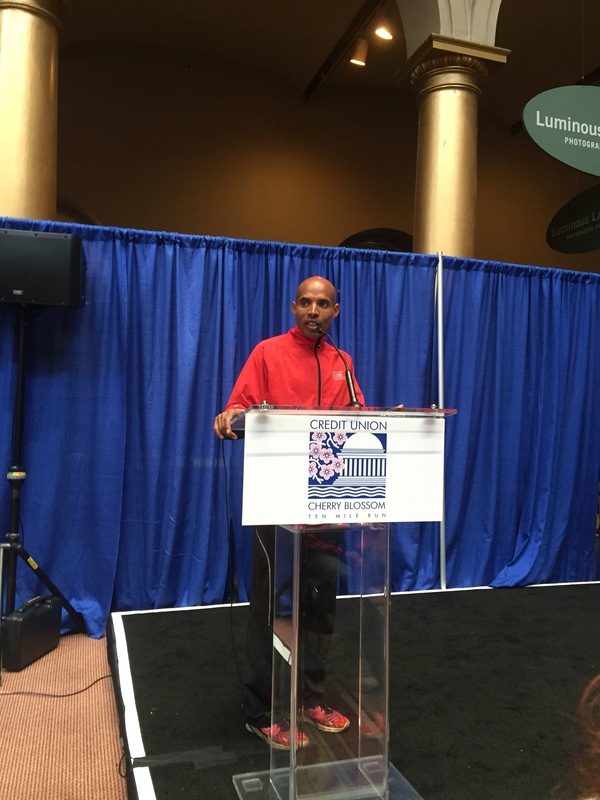 Meeting Meb Keflezighi and Running my first Postpartum race. 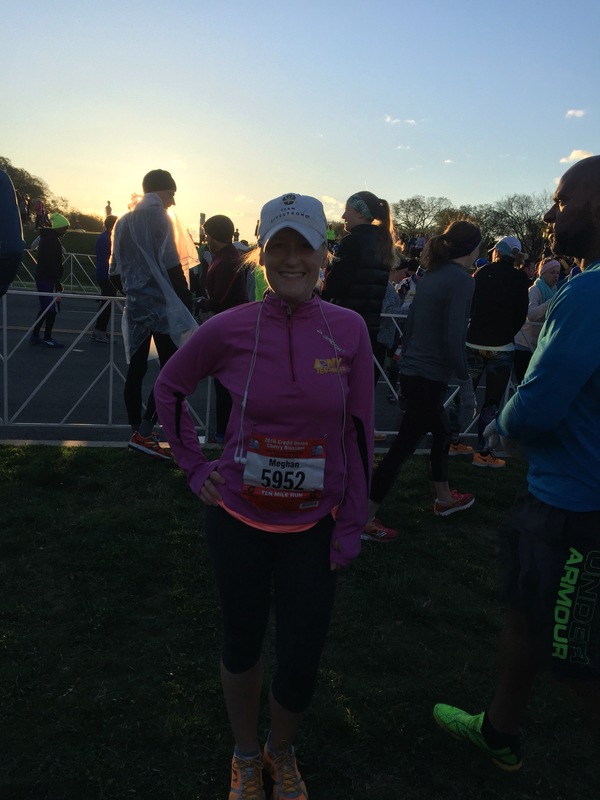 Last Sunday (April 3, 2016) on one of the record breaking windy weather days, I ran my first race postpartum – the Cherry Blossom 10 Miler. In 2008, the Cherry Blossom 10 miler was my first race I ever ran. I have run this race every year since, except last year when I was five months pregnant with Zoe. I love this race because for me, it symbolizes spring, the end of the cold winter, and the start of my training/race season. 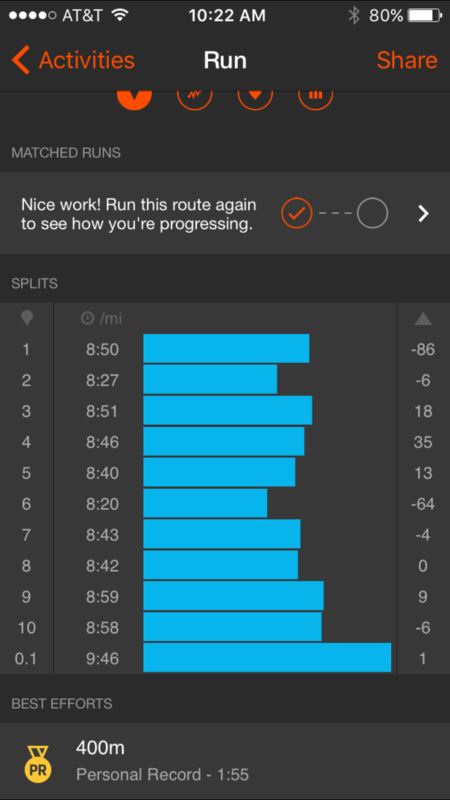 Most of my runs have been shorter runs during the week. I normally run 3-5 miles with Zoe. 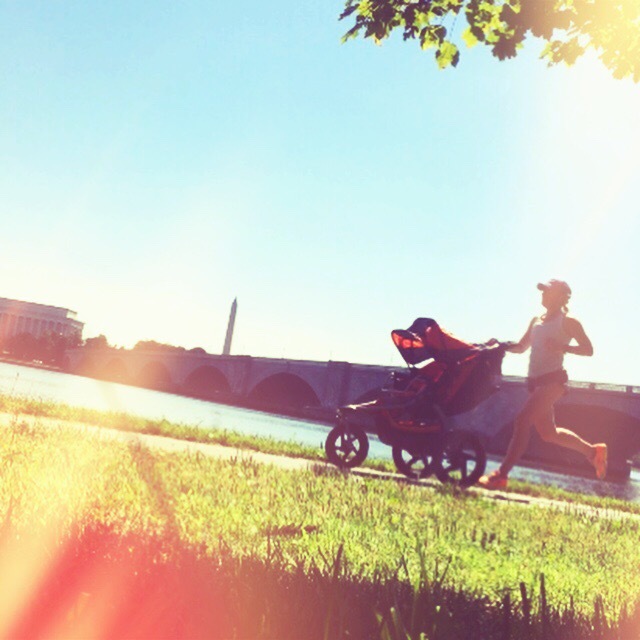 Pushing the stroller really has made me faster and stronger. I am just beyond thankful that both my baby and I enjoy runs together. It makes it so much easier for me to fit my runs in. I usually wake up early with her and we head out for a run. Running is now part of our morning routine. On the weekends, I would get out there and run a little further. I personally define a long run as any distance 10 miles and further. But when training for this 10 miler I didn’t feel the need to go further than 8 miles. So I did a couple 8 milers at a pretty decent pace. 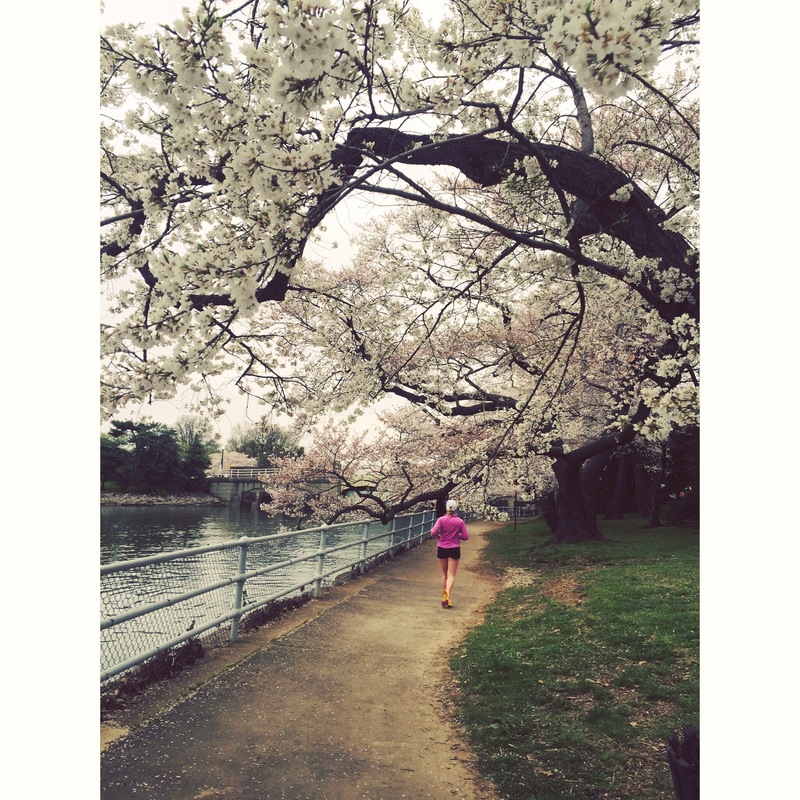 Lina met me for an 8 miler on Easter morning and we ran to the cherry blossoms and back. As always, I headed to the expo to pick up my bib. 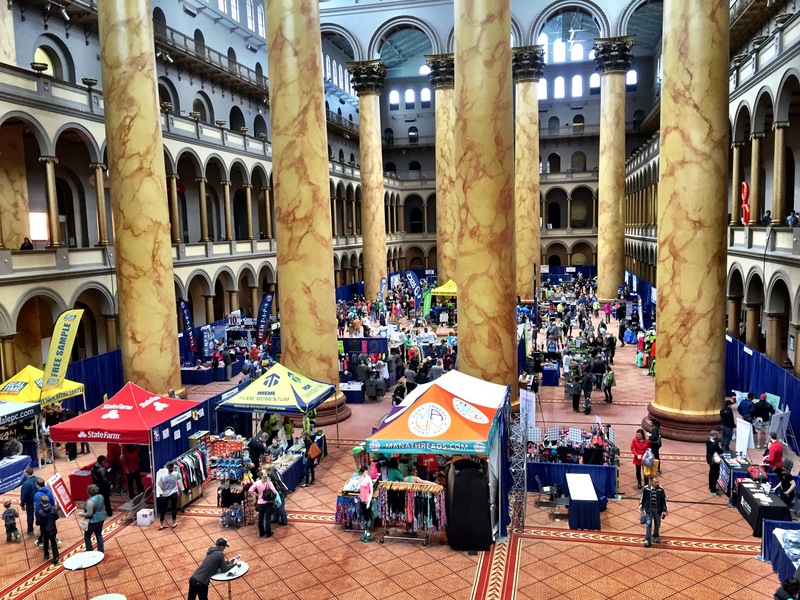 The expo for this race is always held at the National Building Museum. I browsed the expo to see if there were any good sales or new vendors. It was at the Cherry Blossom 10 miler a couple years ago that I discovered Newton running shoes. 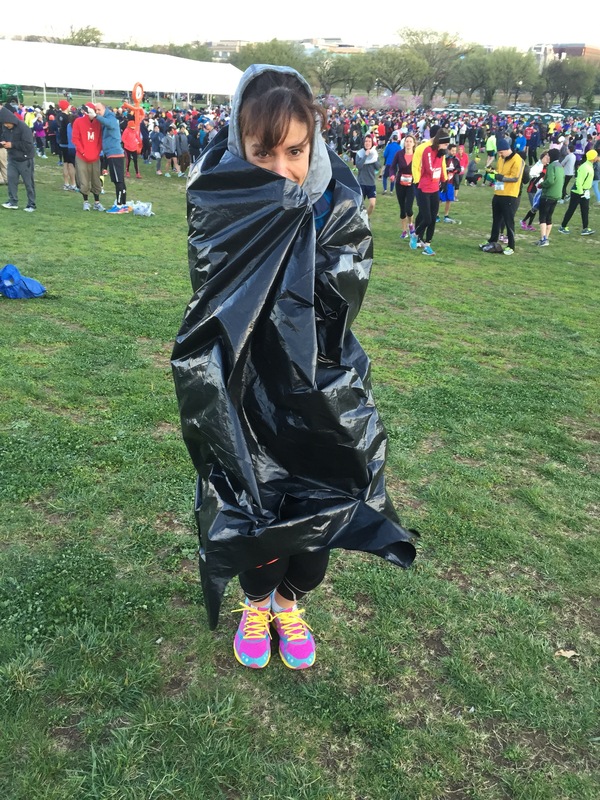 So you really don’t know what you’ll find that might be a major game changer for your running. So enjoy the expo and explore a little. One new brand that I did find at this expo was Mana Threads. It is a fitness clothing brand owned by two Brazilian sisters. I bought a sports bra and tank top from them. The brand isn’t necessarily for runners. But the colors were amazing and fabric soft. I’m getting really bored of lululemon and just want to have some fitness/running clothes that are NOT lulu. However, the absolute most exciting thing about the expo was meeting Meb Keflezighi. I was definitely star struck. For those who don’t know… Meb Keflezighi is a famous marathoner. He won the Boston marathon in 2014. He also is heading to Brazil to run in the Olympics. Anyway, it was pretty exciting to see him and hear what he had to say. He talked about his first marathon ever, and how he was a couple seconds shy of making the olympics. Although, he is really fast, his story was one any runner could relate to. My favorite part was when her said… the marathon was so painful he made a vow to himself that he would never run another marathon. That sounds pretty familiar, so many of us have said the same words. 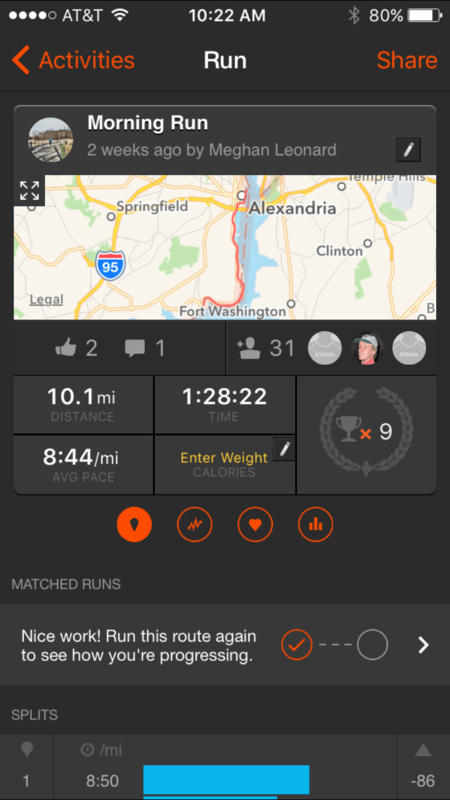 He also ran the Cherry Blossom 10 miler race. He told everyone he would be running a 6 minute pace. And although, there is no way I would be running that fast, I did look for him on the course. It is just amazing to have run a race that he also was running in. 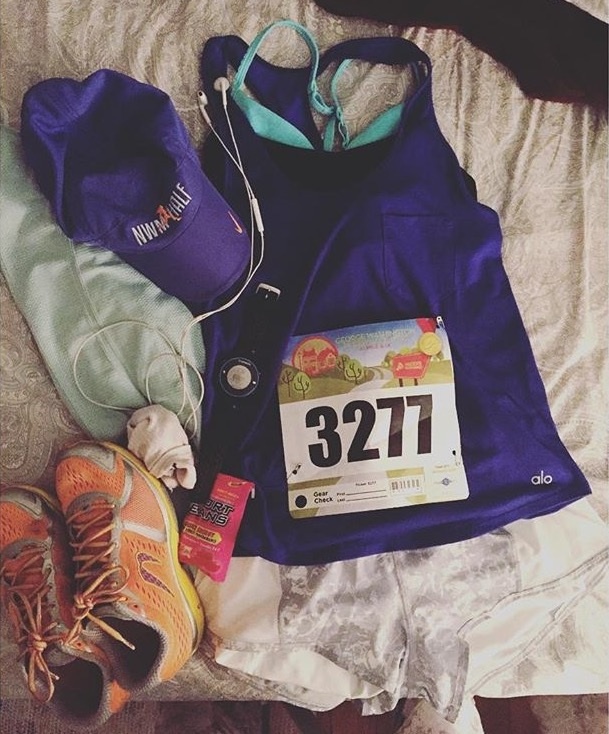 As always I laid out my race outfit, so I would be ready early in the morning. 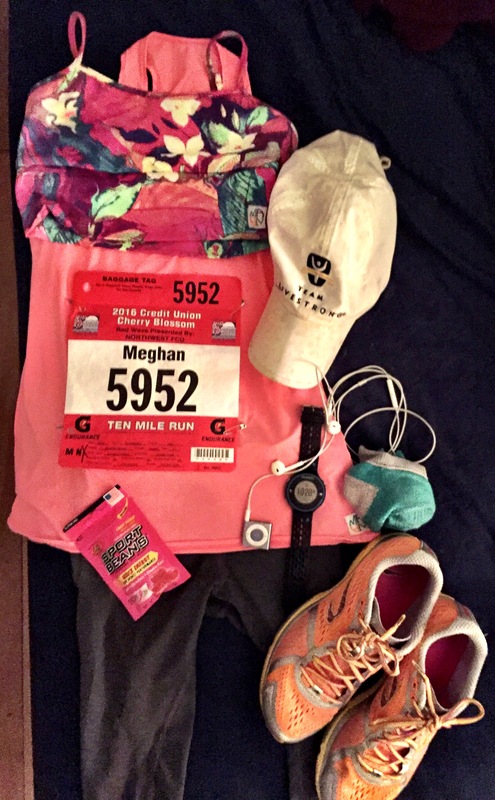 The sports bra and tank are by Mana Threads – the new ones I purchased at the expo. Turns out the night before the race became super windy. And I ended up wearing a long sleeve top. Just to put it in perspective how cold it was, there has only been two other races, that I have run in long sleeves. It is very rare for me to race in something other than shorts and a tank top. Lina met me at my house and we drove over to the metro together. By 6:30 we were off the metro and heading toward the bag check. We waited around the start freezing our butts off. It was cold and the wind made it painful. 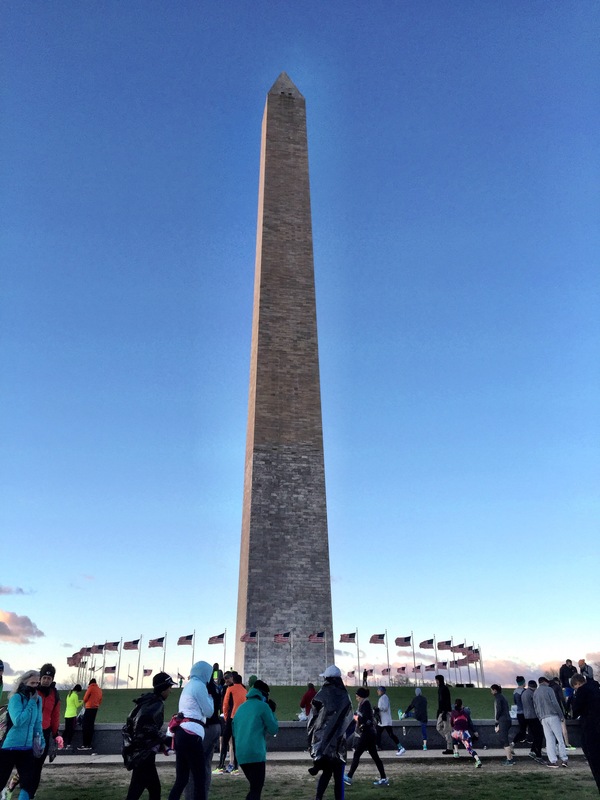 The race starts and finishes at the Washington Monument. Look at those American flags blowing aggressively in the wind. Finally we headed to our corral. Because of the wind, the course had NO mile markers. The only other race that I ran with no mile marker was the North Face Endurance Challenge half marathon, and that race was a trail run. Anyway, because there were no mile markers, I decided to just enjoy the race, and run based on how I felt. So I didn’t look at my watch, not even once. This was my first race postpartum so I wasn’t working for a new PR, instead I was just seeing how I would do. I was mainly using this race as one to help me measure my fitness level. I recorded the race on my Garmin 620. This was my first time racing with this watch and it was awesome. The watch vibrates at every mile, so although there were no mile markers, I still knew where I was at. Just for fun, I also recorded my race on Strava. 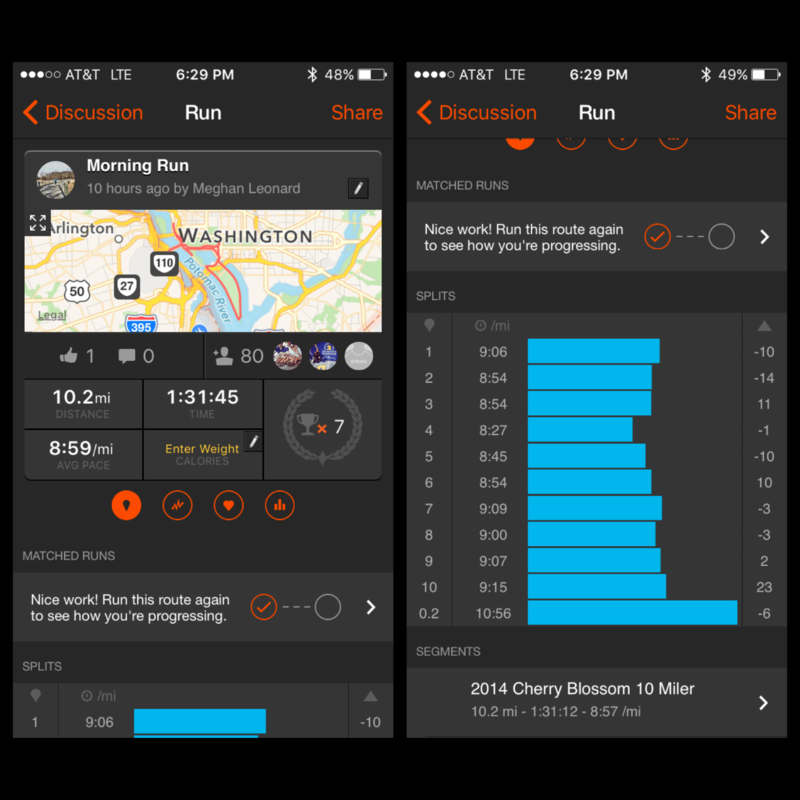 I’ve been using this app as a back up record for my runs. 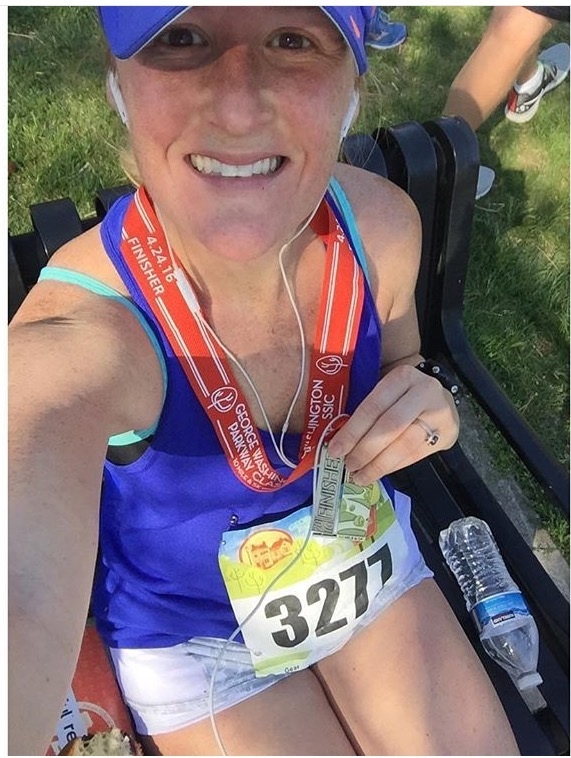 It is also really awesome because it allows me to connect with other runners. I am actually following Kara Goucher. Because she is an elite runner seeing her runs gives me inspiration. My official time was for this race (Cherry Blossom 10 Miler) 1:31:12. Honestly, I felt really good running this race. My form and stride felt effortless. I just kept going. The wind was crazy though. Sometimes we were running right into it, other times it felt like it was coming from all directions. The last two miles we were running right into the wind. Because of the wind I felt like I was slowing down, but after I crossed the finish line I felt like I could have kept going. Sometimes in running, you find that really comfortable pace that you just settle in – I found that pace during this race and it felt like I could run forever. Because I felt so good, I actually didn’t eat any of my sports beans. I normally always take them every 6 miles, but because I didn’t train using them, I decided not to use them. Over all I am really happy about my first race back postpartum! I am feeling more and more like the athlete I was before pregnancy. I am very pumped to keep pushing during my runs and to become even more consistent with my lifting. I need to find a way to stay even more consistent. Consistency is key when seeing results. 1) Keep pushing hard with my runs. Working on distance and speed. 2) Continue lifting consistently. I am currently on the livefit trainer week 5. Can’t wait to see more results by getting stronger and building more muscle.